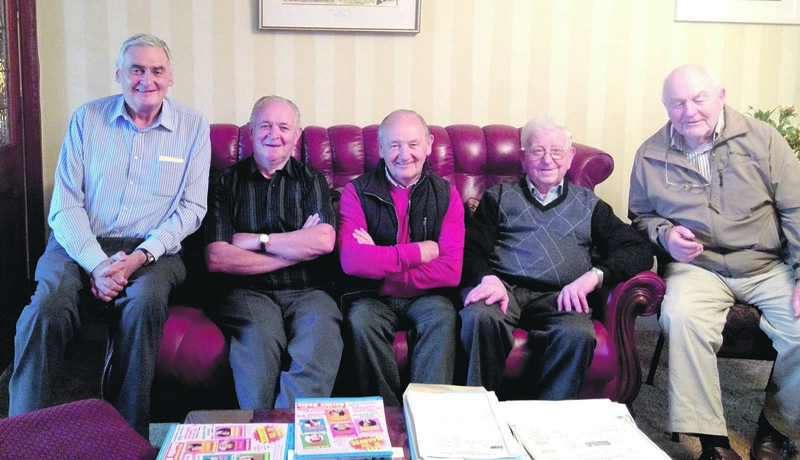 Killala Marquee veterans, from left, Seán Hannick, John Murphy, Liam O’Hara, Willie McGregor, Joe Donohoe. When Seán Hannick was making plans for the marquee dances 50 years ago in Killala, he wrote everything down on the backs of cigarette boxes and the blank side of old tickets from the GAA club. The office was the telephone kiosk outside Willie McGregor’s shop – the number was Killala 20 – and anyone passing would answer the phone, and they would all know where to find Seán if it turned out to be someone important, like Big Tom’s manager, on the other end of the line. Now half a century later, the same man – Seán Hannick – has a mobile phone, and is using a proper notebook to jot down his to-do list for this summer’s marquee. Not everything changes, though; the old gang are still lounging about on his sofa – Willie McGregor, Joe Donohoe, Liam O’Hara, John Murphy – reminiscing about the old times while Seán prepares for the new. Ah, that first marquee – night after night for two glorious weeks, spent jiving away to the big bands. The Dixies were the first up; it was five shillings in. Joe Dolan and the Drifters played, and Dicky Rock and the Miamis. The young people arrived from everywhere – from Belmullet to Dromore West; buses were organised from Enniscrone to Glenamoy. It was a lot of work to stop people crawling in under the canvas to get in without paying – the youngsters patrolled the perimeters until 11, when the older men would come down from the pub to take over while the young ones went to the dance. On the night Big Tom came to Killala, there was a crowd of 1,500 and the box office couldn’t cope. It was Easter and it had started to snow, and the people were so keen to get their tickets that the box office was swaying and threatening to fall over, and the money was spilling to the ground. So Willy McGregor and Joe Donohoe pulled up a car and started selling more tickets out of the back of it – and Joe the schoolteacher let Willie collect the money, because “Willie was in the shop, and he could add up money a lot faster than I could”. There was no alcohol on sale, only minerals: Club Orange and Seven Up, but not Coca Cola – the American drink couldn’t be got till the ‘70s. If a boy asked a girl if she wanted a mineral from the bar, and she accepted, it showed they had an understanding “and that was the beginning of a relationship”. That first marquee raised £515.14s.7d and it was all for the handball alley. Up until then, the lads used the street near the Lodge, and it worked out fine because although the cars were beginning to come in the 1960s there weren’t many yet in Killala and anyway the players would give a young fellow a three-penny bit to cycle around the town keeping an eye out for the guards. That was until the day the guards sneaked through Millar’s woods and came in on top of them, and four players got summonsed. After that it was decided to raise the money for a proper alley, through organising dances. The marquee this year is intended to raise for another worthy cause: cancer research and cancer care in Mayo. This time it is €15 in (and €10 for the Strictly Irish dancing, and the Céilí), and there will be beer at the bar, and no-one will be pretending it is all for a man named John Mortar. So things have changed…but Willie and Joe, and Liam and John, and Maud O’Hara and Seán Hannick will all be there.